The trailer for Michel Montecrossa upcoming Courage & Love Climate Change Musical ‘The House Of Time’ gives a first glimpse of this visionary sci-fi action thriller moving between earth and unbelievable sky-city, diving into the atmosphere of this fullstream consciousness movie about the growth and victory of Cyberwarrior Michel and his avatar Mike in a changing terrestrial and martian world. The film tells the futurist love-story of Cyberwarrior Michel, his dream girls, Mystery, Hazel and the mysterious Lady from the Sun bringing reality passion to cyberworld. It opens new vistas of virtual body and organic body love-making touching the secret of the timebody, good and evil transcended, and follows the journey of Cyberwarrior Michel becoming champ & stream of consciousness musician. Together with his girls Mystery and Hazel and virtuality friends he is bringing courage and love power-music into the multidimensional, organic world of humanitarian, economical and ecological crisis. Michel, Mystery and Hazel know how to freely move in time. They know how to change everything. The House Of Time touches a new level of awareness, it is a free consciousness-stream music-movie combining great music, thrilling action, emotion and passion in unforeseeable ways. 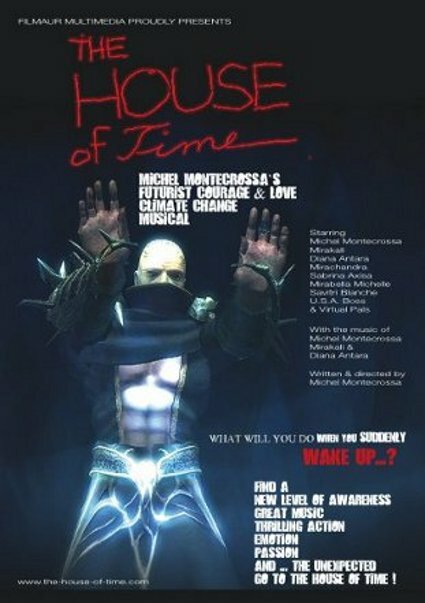 Film-News: Der online verfügbare Trailer von Michel Montecrossa’s futuristischem Courage & Love Climate Change Musical ‘The House Of Time’ bewegt sich in Science-Fiction Umgebungen einer sich wandelnden irdischen und marsianischen Welt, betritt die unerklärliche Sky-City und handelt von Weg und Triumph des Cyberwarriors Michel und seines Avatars Mike sowie seinen Dreamgirls Mystery, Hazel und der ‘Lady from the Sun’. Gezeigt wird eine Zukunfts-Lovestory, die Gut und Böse transzendiert, und das Mysterium des Zeitkörpers in organischen und virtuellen Liebesbeziehungen berührt. Cyberwarrior Michel, seine Girls Mystery und Hazel und befreundete Wesen aus der Virtuellen Welt bringen Heldenmut und Liebespower-Musik in das mehrdimensionale Geschehen der Welt, die sich inmitten einer humanitären, wirtschaftlichen und ökologischen Krise befindet. Sie kennen das Geheimnis, wie man sich frei innerhalb des Zeitstroms bewegt und wie alles verändert werden kann. ‘The House Of Time’ ist die Öffnung zu einem neuen Level der Wahrnehmung und definiert beispielhaft Filmemacher Michel Montecrossa’s Weiterentwicklung des Mainstream-Cinema in die von ihm als ‘Fullstream Consciousness Cinema’ bezeichnete Filmkunst. 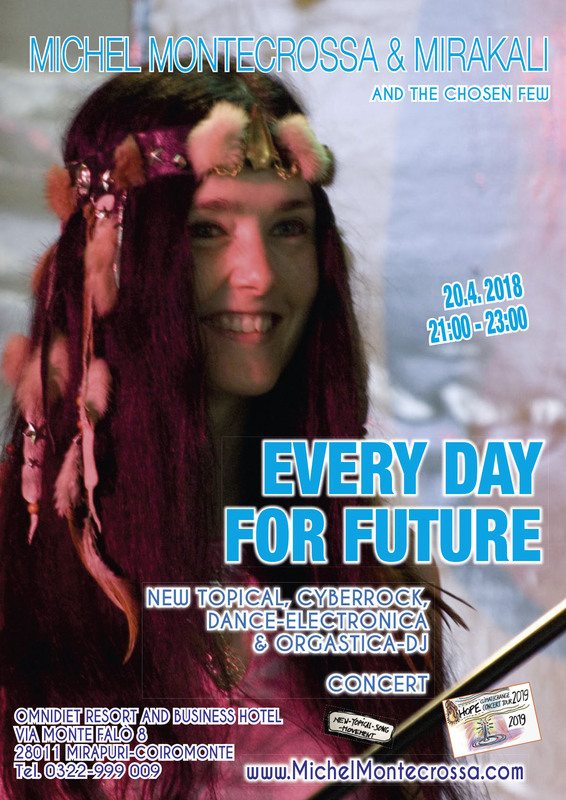 Die Premiere von Michel Montecrossa’s ‘The House Of Time’ Courage & Love Climate Change Musical findet im Juni während des International Free Cinema Filmfestivals in Mirapuri statt. This entry was posted in Climate Change & Environment, Movie / Video, Neuerscheinungen & News, Trailer & Previews and tagged art film, Independent Cinema, Montecrossa, Movie, Music movie, Trailer. Bookmark the permalink.